If you stand in the Lüneburg Heath (German: Lüneburger Heide) on an early autumn day when the heather is in bloom, your mind might surrender to the illusion that you are sailing on the rising and falling waves of a red-violet sea. Returning just a month later will find you there in time to dine on Schnuckenbraten, a local specialty of roasted Heideschnucken sheep (possibly the same sheep you witnessed peacefully grazing under their shepherd’s watchful eye during your earlier visit!). Hike, bike, or gallop along the footpaths, graveled bike paths, and bridle paths which crisscross the 300 km length of Lüneburg Heath’s nature preserves. Gaze in wonder at the Heath’s ancient Seven Stone Houses, which are actually five giant megalithic tombs dating to around 2500 B.C. Visit the burial site of the great poet, Herman Löns, whose work so wonderfully evoked of the romance of the Heath you have walked. There is far more to see and do on the Lüneburg Heath, located between the Aller and Elbe Rivers in Lower Saxony, than you could experience in a single visit. I’ve narrowed down its attractions to the ones I find most appealing. The Schneverdingen Heath-Garden, located in the town of Schneverdingen, on the southwest edge of the Lüneburg Heath, is the place to visit if you can’t travel to the Heath when the heather is blooming. The Höpen Heidegarten (Heath Garden) in Schneverdingen contains 120,000 heather plants of 140 separate species, and some of them are in bloom at any time of the year! Wilseder Berg soars 554 feet (169 m) above the heart of the Lüneberg Nature Park Reserve, making it the highest point in the northern German lowlands. 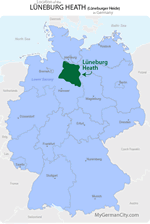 Lüneburg Heath is prime equestrian country, with two hundred of the top Hanoverian stallions in the world standing at the Niedersachsen State Stud in the city of Celle. The annual Celle Stallion Parade is timed to coincide with the blooming of the Heath in late September and early October. Perhaps the most breathtaking display is the thirteen-horse hitch. Don’t overlook the charm of Celle itself, with its streets of marvelously-maintained half-timbered houses. While it won’t be quite as dramatic as the Stallion Parade, you might love ascending Wilseder Berg in horse-drawn carriage. I know many did! The spa town of Hodenhagen is a short drive from the Walsrode Bird Park. When you’ve had your fill of feathered friends, head for the Serengeti Safari Park in Hodenhagen and drive through Animal Land. You’ll glimpse of at least a few of the 1500 four-footed friends which roam freely there. The most impressive of the Lüneberg Heath amusement parks, however, is certainly the Heide-Park in Soltau. Not only is it the largest amusement park in North Germany; it has its own wildlife park where more than 200 native animals thrive in completely natural settings. It also has the tallest wooden roller coaster on the entire planet! Finally, you can’t leave Lüneberg Heath without visiting its “capital,” Lüneburg! For a thousand years, beginning at the end of the 10th century, Lüneburg was one of the world’s major salt-producing cities. The great wealth amassed by its citizens is evidenced in its Town Hall, the construction which began in 1230 and continued for nearly five hundred years. The forty-one Meissen bells in its tower still sound each day. A visit to the Deutsches Salzmuseum will give you a fairly good idea of how important ordinary salt was a preservative before the days of refrigeration. Taking a stroll through the Senkungsgebiet, the most ancient part of Lüneburg, will place you directly over the spot where salt was discovered.